After posting a 12-0 record in the Suburban League and advancing to the third round of last season’s CIF-Southern Section Division 2 softball playoffs, La Mirada High School hopes to take the next step. 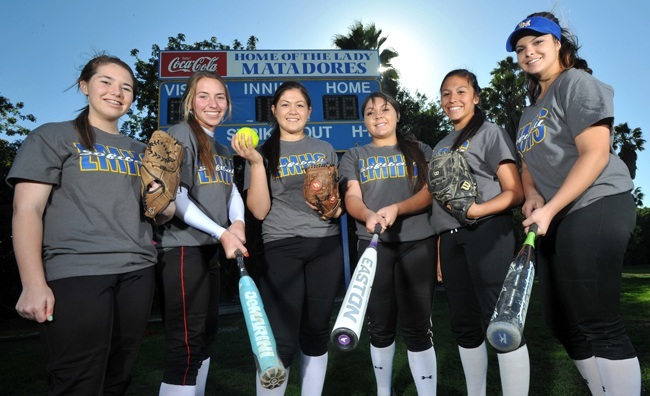 The Matadores, who finished 23-8 last season, lost key contributors such as pitchers Amber Hickman and Jenevie Rivas, catcher Lisa Perez, first baseman Rochelle Sablay and outfielder Mylee Macahilig to graduation, but they have plenty of returning talent. That group includes senior third baseman Lindsey Cole, senior shortstop Mercedes Gasparovic and senior outfielder Christiana Viayra. Cole, who batted .380 and drove in eight runs last season, will look to play a bigger role in 2013. Gasparovic hit .291 with two home runs and 18 RBIs. Viayra will seek to improve on her junior numbers, which included a .206 average in 45 at-bats. Junior catcher-outfielder Annie Dipillo (.370, three home runs, 23 RBIs) also figures to play a vital offensive role. With Hickman and Rivas gone, sophomore Valerie Alvarado and junior Stephanie Baro are in line to take over primary pitching duties. Alvarado posted a 4-1 record, 1.10 ERA and 53 strikeouts in 44 2/3 innings. Baro was 4-1 with a 1.58 ERA. “We’re going to make a run at it this year,” La Mirada coach Rich Trujillo said. “We have a lot of confidence. We’re a little bit young. We had seven seniors last year, but we have juniors who are stepping right in. Soccer talk: Who should be the Whittier area’s players of the year in boys and girls soccer? Hello, high school sports fans. Since the high school soccer season is in its final stages, it’s time to start thinking about who should be considered as the player of the year in both Whittier-area boys and girls soccer. So which players are most worthy of the honor? I would like to hear from you. The CIF-Southern Section soccer championship game schedule has been posted at the CIF-SS website. El Rancho High School, making its third consecutive final-round appearance, will face Channel Islands in the Division 3 boys soccer championship game at noon. La Serna, headed to its second straight title game appearance, will take on Cabrillo of Lompoc in the Division 5 girls soccer championship game that is slated for 5 p.m. Both games will be played at Warren High School in Downey. SANTA ANA – The El Rancho High School boys soccer team still might be sprinting for joy after their dramatic playoff win Tuesday. Senior forward Cristian Roldan was leading the charge the length of the field with his team in tow after scoring a golden goal in sudden-death overtime for a 3-2 semifinal victory at Century to send the Dons to their third consecutive CIF-Southern Section Division 3 title game. Roldan, who has 53 goals this season, scored all three goals for the top-seeded Dons (25-2-1). They will face Channel Islands, which defeated Palmdale 5-4 on penalty kicks after a 2-2 tie in regulation. The CIF-SS office will announce the time and location of the game today. Roldan, headed to the University of Washington next season, scored on a set piece off a corner kick by senior midfielder Miguel Vilchis in the 87th minute. Vilchis had just re-entered the game after appearing to injure his leg early in overtime. Roldan out-jumped the Century (14-10-4) defenders and headed the ball just inside the goal line. From there, the 2012 Whittier Daily News Player of the Year was off to the races and sprinted almost 100 yards, much to the delight of a large contingent of El Rancho fans. DOWNEY – With Downey and visiting La Mirada highs finally putting pressure on each other, it was just a matter of who was going to crack first. The calm and confident Vikings stood strong and the offense produced two quick goals midway through the second half to lead Downey to a 3-0 victory in a CIF Southern Section Division 4 semifinal Tuesday night. The win propelled the Vikings (22-4-2) to a third consecutive trip to a CIF-SS final. After losing in 2011, they won their first championship in Division 5 last year. It was that postseason experience that was the difference Tuesday and, for that matter, the entire season for second-seeded Downey. Downey will face Quartz Hill, which upset top-seeded South Torrance 1-0 in overtime, in the championship game. CIF-SS will announce the date and time of the game today. 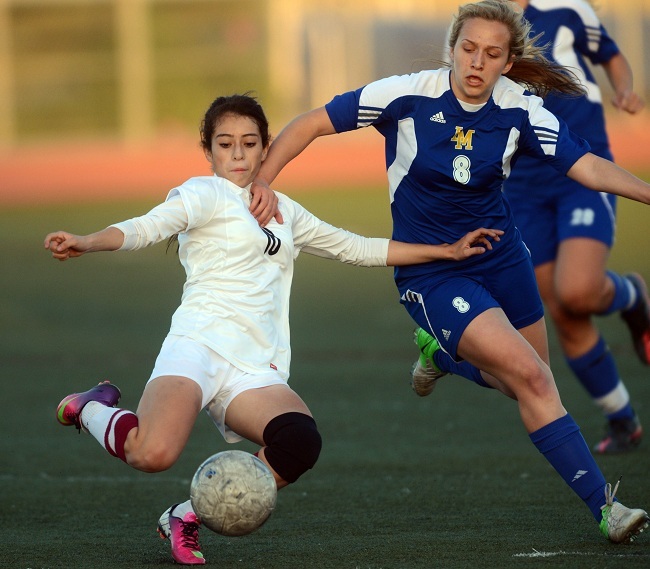 The semifinal was a rematch of a game Downey won 1-0 on Dec. 21. That was the last time La Mirada (17-4-7) lost a game. It had gone 13-0-5 since then.